Chelsea Dawn Chawsky is an on-site professional Make-up Artist and Hair Stylist; the perfect combination for your dream wedding or next special event. Her passion for beauty, art and fashion began at a very early age showing a flair for her own sense of style. She became a certified Hair Stylist over 8 years ago and was commissioned to provide her services for her first fashion show. She quickly realized that she had a love for special event hair and make-up. She was able to fine tune her artistry skills and perfect her beauty techniques while working a MAC cosmetics. Some of her work has been seen in Bridal magazines and in non-profit films. She also has supplied free services to some local women’s shelters. Whether her responsibilities take her on location to a wedding, special event, fashion show, film or photo shoot, or for some of her charity work, Chelsea displays the mastery for creating the perfect look. 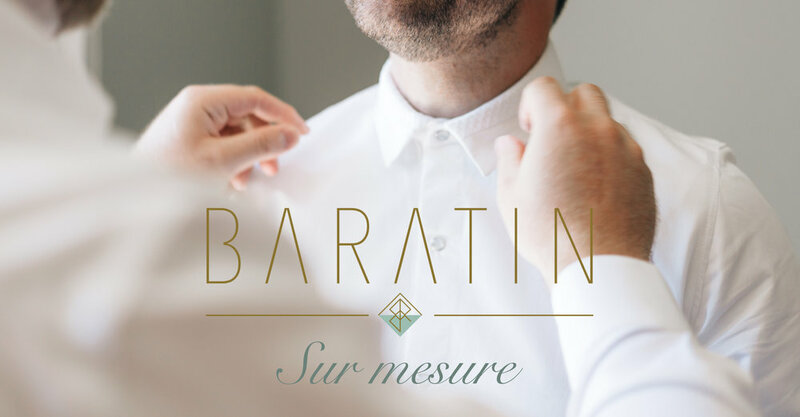 Baratin est avant tout une ligne de prêt à porter pour homme qui offre également l’expérience du service de confection sur mesure. Pour un mariage, le travail ou autres occasions spéciales, simplifiez vos recherches en élaborant avec nous la tenue parfaite, qui vous rendra encore plus fier lors cette journée. Contactez-nous pour plus de renseignements. Fine Jewelry, delightfully Art Nouveau, charmingly Orientalist, magnificently Napoleon III and escaped from cabinets of curiosities. As reflected by my jewelry, I am passionate about history. I have always been fascinated by Empress Eugenie, wife of Napoleon III. Patron of Arts and Letters, Eugenie pushed for the development of arts. The word "Bee" is a reference to one of Napoleon's imperial emblems and the organic representation of Art Nouveau; hence where the name Eugenie Bee is from. My creations are influenced by four main sources of inspiration. First, Art Nouveau. This era was the height of good and refined taste. It was inspired by natural forms and structures, not only by flowers, plants, and animals representations but also by curved lines. Then, the Second French Empire, a time characteristic of Haussmann architecture, Napoleon III Bridge and the Opera Garnier in Paris. I am also very inspired by the Orientalist movement, an expression of a fascination for the east from European artists. Finally, I love the Art Deco period for its square and geometric shapes, and the androgyny of fashion in the 1920s. When I design or craft jewelry I make it foremost for me, because I want to wear the piece. This is why that I pay great attention to detail. I have the same high quality standards when making my jewelry than I'd have if I was buying it. Therefore, I only use top quality materials that are built to last and timeless, and design the pieces to fit perfectly. All the headpieces and earpieces are made to measure so everything fits like a glove. If you have any special requirements, feel free to contact me! I prefer timeless jewelry that will go with everything and will be passed down through generations. As the great Yves Saint Laurent said: "Fashions fade, style is eternal."